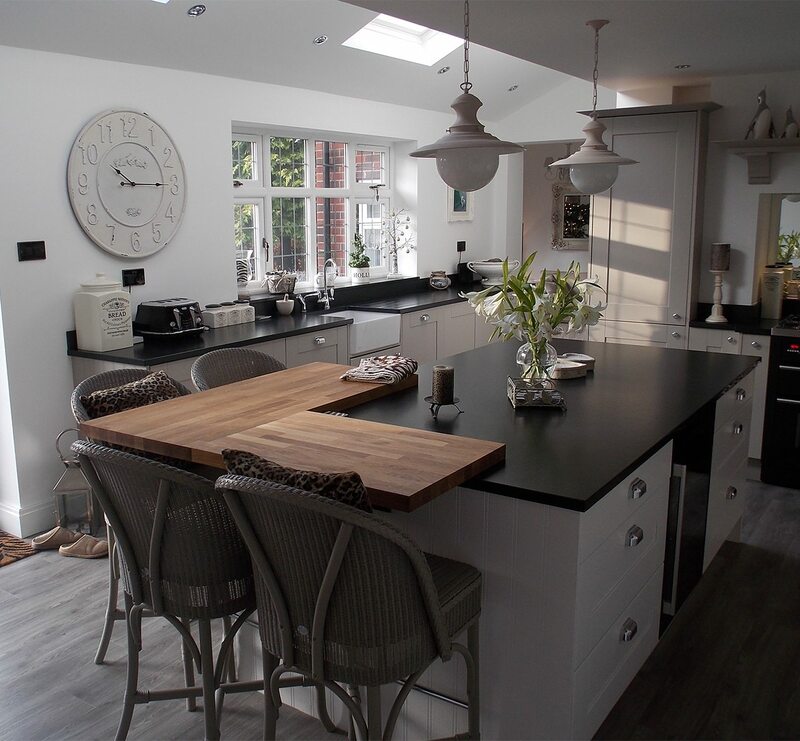 A major home refurbishment project resulted in a fabulous living space for the Wild family. Leading exceptionally busy lives, Wayne and Maxine Wild, who run a successful engineering company, recently re-designed their whole house, involving no less than 16 rooms and adding a two-storey extension that would allow them to develop their dream living space. On the ground floor they wanted to create a huge open plan kitchen, dining, entertaining and living space that would be the heart of the home – an area used by all the family but just as suited to entertaining friends. 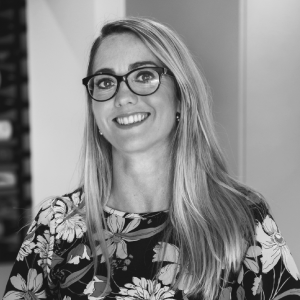 Maxine had a good idea of what she wanted in terms of design and through word of mouth, she asked KDC designer Suzanne Carter to come up with a scheme that ticked all the boxes, as Suzanne explains: “I had been working on a kitchen for one of Maxine’s relatives, that’s how I met her. 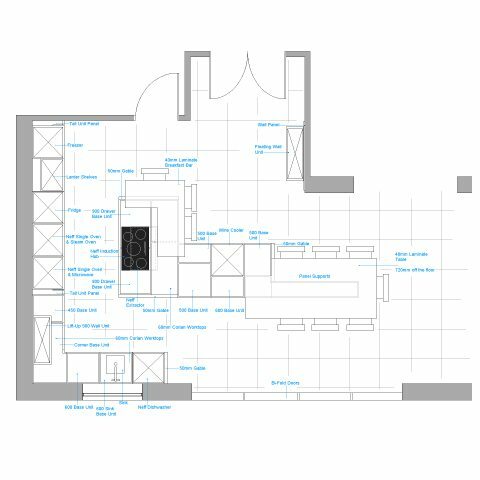 At the time Maxine and her husband were in the process of building a double storey extension so I was able to work on the kitchen from architect’s plans. Maxine chose German manufactured Hacker handle-less base and wall units in Laser Brillant with a shiny Cashmere lacquered finish. To contrast Atlanta Grey acacia wood was used for the table and feature wall panelling in the kitchen, which is also used as a family space that overlooks the fields outside. A keen cook, Maxine opted for a whole arsenal of top-of-the-range Neff appliances including a dishwasher, microwave, two single ovens, a steam oven, a big fridge and large freezer along with an induction hob and a flush mounted ceiling extractor that mirrors the island unit. As this was a new-build extension, there were very few problems encountered on the project – however a large supporting beam on the original exterior wall had to be incorporated into the scheme: “A special unit was made to encase the beam so it slotted seamlessly into the design,” says Suzanne. Corian worktops in White Jasmine and a series of pendant lights over the large kitchen table that accommodates up to 10 people, completed the look along with Maxine’s own finishing touches. The end result is truly stunning: “It’s exactly what I wanted to achieve,” said a delighted Maxine. 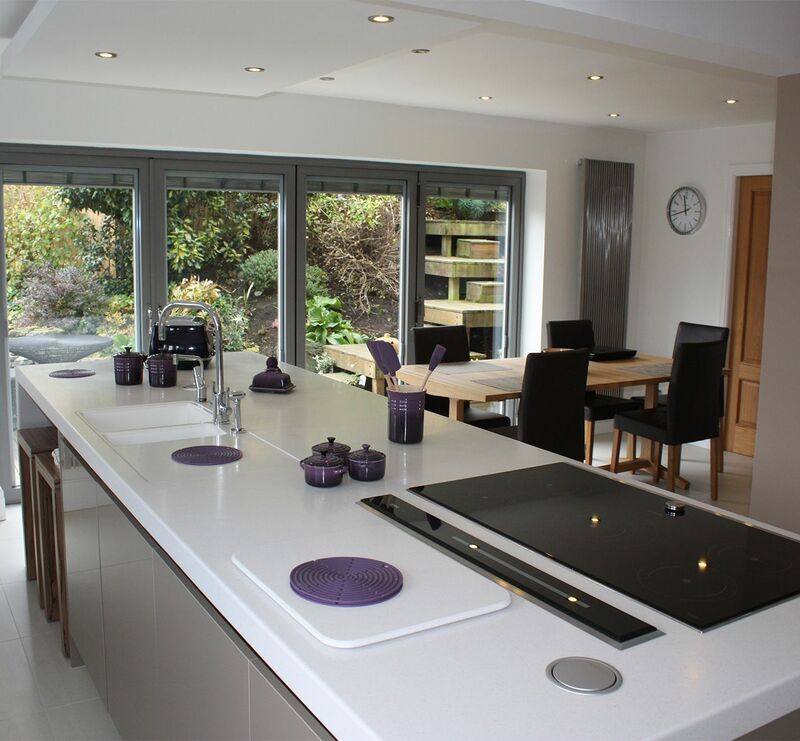 “We wanted a big space for family living and we have brought the outside in with bi-fold doors. 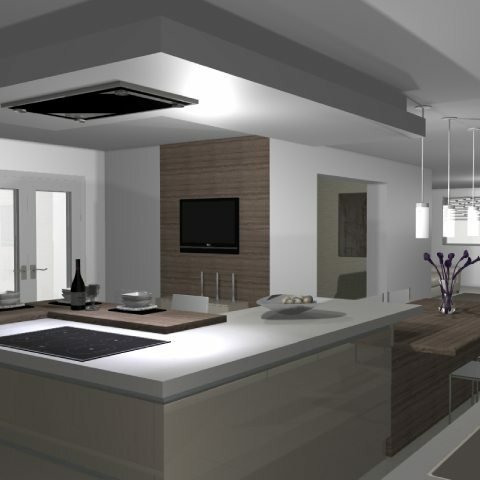 It really is a multi-purpose area designed for dining, entertaining and cooking. “I had been trying to visualise the kitchen but in fairness to Suzanne, she came up with a design that perfectly matched my wish list. The Wild family, who had moved out of their house while major construction work was carried out, moved back in just two days before Christmas: “The fitter even came over on Christmas Eve to put some final finishes touches to the kitchen,” recalls Maxine. 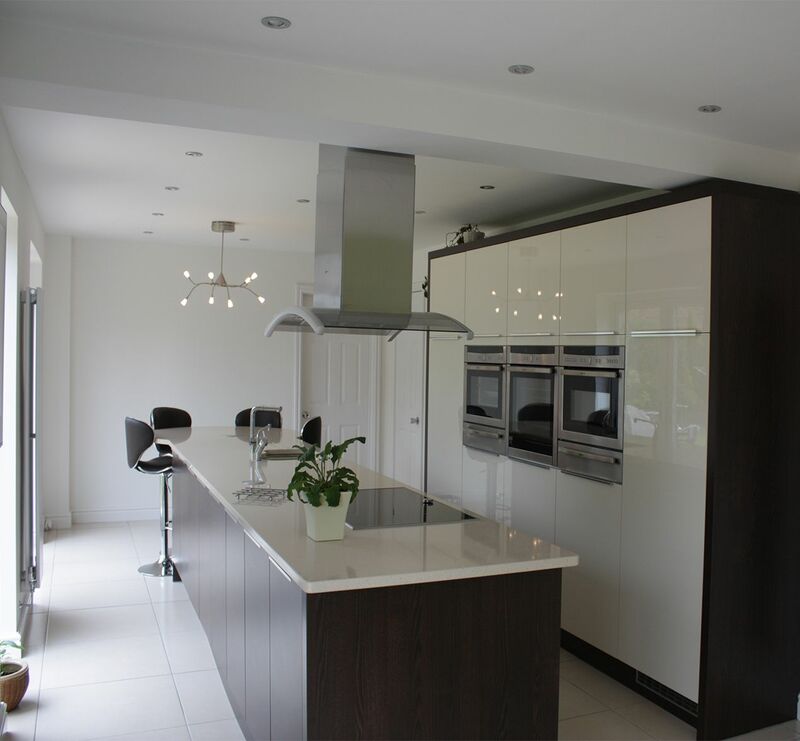 “The people at Kitchen Design Centre were really flexible, they didn’t rush us, which was great considering we had so much going on. 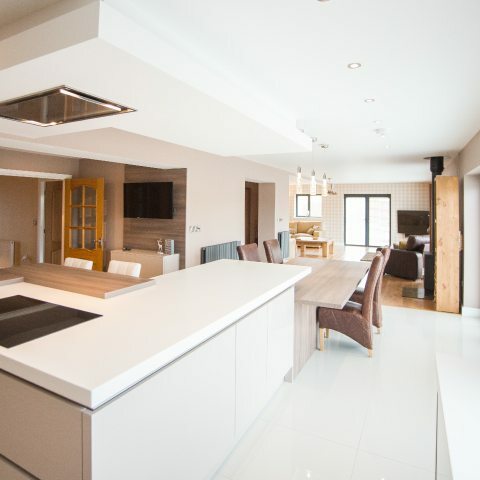 "The service we received from Kitchen Design Centre was amazing considering the amount of work that was going on throughout the whole of the house." "I had been working on a kitchen for one of Maxine’s relatives, that’s how I met her. At the time Maxine and her husband were in the process of building a double storey extension so I was able to work on the kitchen from architect’s plans." “We worked off Maxine’s wish-list as she wanted a large table, off an island unit and a big open entertaining and living space."